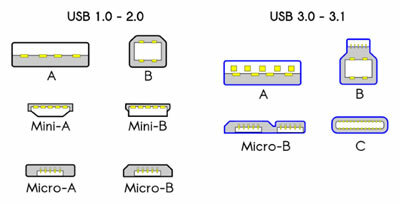 Key Difference: Type A, B or C usually refers to the physical design of the plugs and the ports, while the versions determine the functionality and the speed of the USB cable. Technology is extremely fast-faced, and by the time you’ve mastered one, the world has probably moved on to something more advanced. This works with everything, from operating systems, to phones to even the cables. If you’ve ever bought a device, such as phones, printers, cameras, then you’ve probably received some type of cable to either charge it or to connect it to a computer. Or if you’ve ever borrowed a charger from your friend, you’ve probably asked the type of charger your friend has, if it’s Micro USB or Type C or even lightening (for those iPhone lovers). Well, these cables and chargers are often classified between Types A, B or C.
But, what is the difference between them exactly? Why are they labelled this way? And how do you know which one do you need? Well, here’s where things get a little tricky and confusing. The three types are often used for different purposes or are upgraded versions of the older. There are also different versions among the different cable types and also different speeds. I’m sure you are now even more confused, but don’t worry we will help you solve out this little conundrum. So for starters, there are three main types of cable – Type A, Type B and Type C. Now, Type A and Type B also have subtypes which include Micro and Mini. There are also different versions 1.1, 2.0, 3.0, and 3.1 but these are only used in relation to speed. So, a higher version of USB means that the cable is capable of transferring data faster. However, the older versions such as 1.1 and 2.0 are slowly going obsolete, so you won’t have to worry about that for long. Now, getting down to the different types. When we talk about plugging a USB cable into your computer, the port that is available in the back of your CPU, that is a Type A port and ideally it required a Type A cable that would go into this port. The most common devices that still support type A are mice and keyboards. Type A ports are still the most common type of ports that are available, but the other end is usually some type of Type B or can also be Type C. Type A ports and cables are flat and rectangular that usually insert only one way. Type B are smaller and a bit squarer in shape than rectangle when compared with Type A. These are most commonly found on devices such as cameras, printers, etc. However, these type of cables are quickly going obsolete or are being replaced by newer and smaller versions. This brings us to the Mini and the Micro USB cables. Mini and micro USBs were created to cater to smaller devices such as hard drives or sleeker printers and scanners. While, minis are still rare, micro USBs are cables everyone who uses Android phones are familiar with. The charging cables on your Android smartphones still use Micro USBs to connect to the phones. However, fairly recently we are now being introduced to Type C cables. The selling point of this cable was faster transferring speeds and reversible feature. Type C cables are sleeker and flatter compared to Type A and Type B, but are longer than the Micro USBs. However, they can be inserted both ways into the device, which means that you won’t have to struggle to figure out which side of the cable is up and which is down. This cable was originally introduced on an Apple Laptop, but it has been quickly picked up by a few companies such as Samsung, Google for their brand new smartphones. The main thing that you need to understand is that the Type A, B or C usually refers to the physical design of the plugs and the ports, while the versions determine the functionality and the speed of the USB cable. So, in short the Type A, B and C only refers to how the cable looks.